Little known fact: Lewis Carroll paid for the printing of Alice in Wonderland himself. Surprisingly, this isn’t actually all that unusual when it comes to illustrated titles published in the Victorian era. Heavily illustrated books have always been expensive to produce, and many publishers simply weren’t willing to outlay the funds. Another famous example: L. Frank Baum and W.W. Denslow had to pay for The Wonderful Wizard of Oz to be printed. Another little known fact: Alice in Wonderland marks the beginning of the so-called Golden Age of children’s literature. In other words, Alice is the first signpost of books written exclusively for children. Prior to Alice, children’s literature was considered a kind of teaching vehicle, a way to instruct young people in moralistic or religious prohibitions, and the books and stories were often adapted from adult literature. 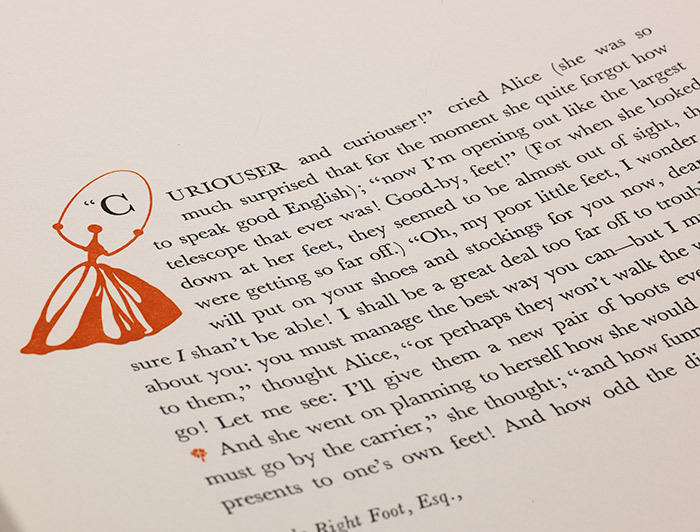 Printed in 1865, the first edition of Alice contained 2000 copies. From those 2000, Carroll was afforded 50 Author’s Copies, which he then signed and presented to friends and family. The story of what happened next has become something of a legend in the book world. 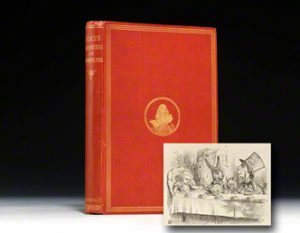 1866 first (official London) edition of Alice in Wonderland in the original cloth. This copy signed and presented by Carroll. Eventually, Carroll canceled the original printing and made arrangements for the book to be reprinted. He recalled the Author’s Copies he’d already presented, promising each recipient a replacement copy once the book had been reprinted. There was just one problem. What to do with the nearly 2000 copies of the book that he already had? Not wanting to lose the entirety of his investment, Carroll sold the canceled copies of Alice to a New York-based American publisher, Appleton. Appleton then simply slapped on a new title page and called it the first American edition. (The first official London edition appeared several months later in 1866.) Only 20 or so copies of the original edition – with the 1865 London title page – are known to be extant. (The majority of those copies are housed in institutions, both public and private.) 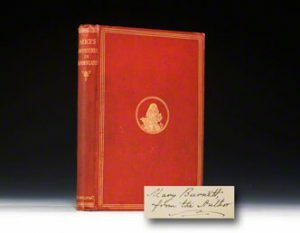 What this means is that the first American edition is essentially the earliest obtainable edition as far as collectors are concerned. 1865 first American edition of Alice in Wonderland. Notice that it looks similar to the first official London edition. In the 1930s, William Empson, an influential literary critic, wrote: “Alice has, I understand, become a patron saint of the Surrealists.” Little did he know how right he would prove to be. 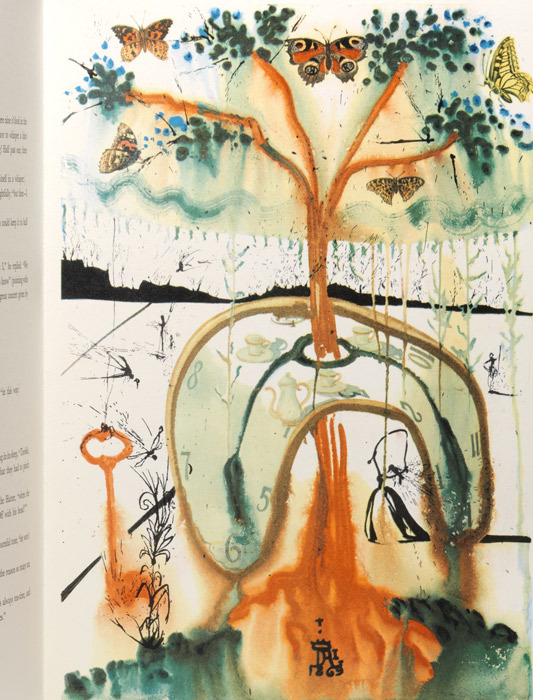 In 1969, as their “Book of the Month” offering, the Maecenas Press (a Random House imprint) published an edition of Alice illustrated by the biggest madman of them all – Salvador Dali. 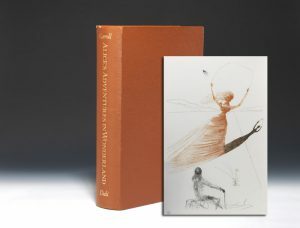 Printed as a loose portfolio, which is housed in a custom clamshell box, the book features 12 full-page color illustrations, as well as an original etching signed by Dali. 1969 deluxe limited edition of Alice in Wonderland illustrated by Salvador Dali. 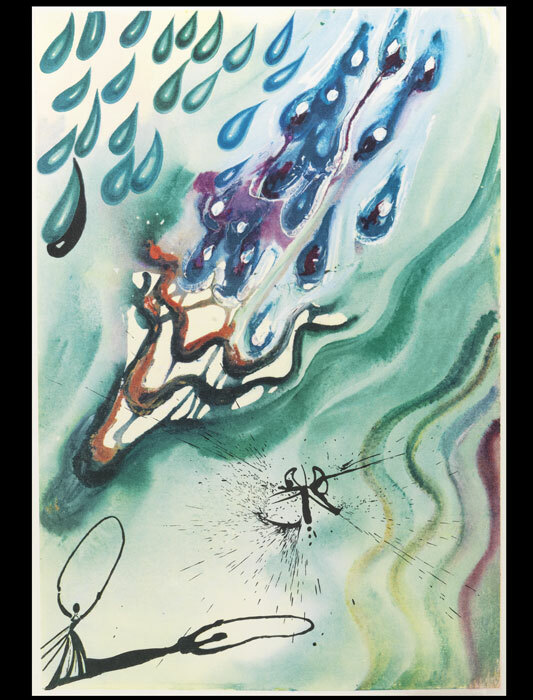 Inset: The original etching signed by Dali, which serves as the edition’s frontispiece. The illustrations, of course, are vivid to the point of searing and perhaps more than a little insane. All of the usual suspects are present and accounted for – the Rabbit, the Caterpillar, the Queen of Hearts. But I have to say, the thing I love most is the sometimes large, sometimes small image of Alice jumping rope. You see her first in the frontispiece and then in every illustration thereafter. I usually joke that it’s a kind of deranged Where’s Waldo. Mostly I think it’s because I see it as Dali’s nod to the fact that – crazed characters and beautiful art aside – the most important part of Alice is Alice herself. 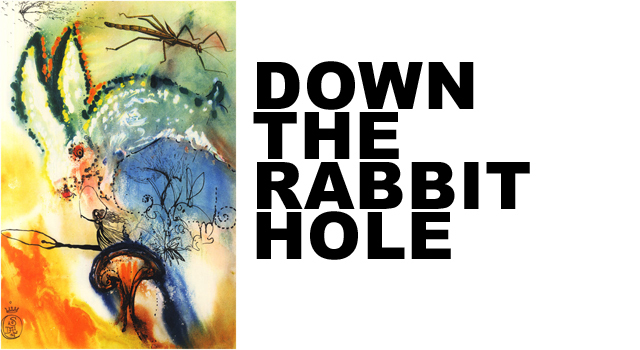 Stop into our Las Vegas, where a copy of Dali’s illustrated Alice is currently on display. Embry is a bookseller at the Las Vegas gallery of Bauman Rare Books. Her studies focused on 19th- and 20th-century British and American poetics, and she received her Master of Fine Arts in Creative Writing from the University of Nevada, Las Vegas. 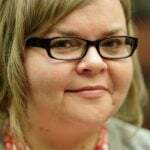 As a writer, her book reviews and poetry have appeared in journals such as New American Writing, Colorado Review, Court Green, Witness, and Interim. When she’s not selling books, Embry reads a lot of military history, detective fiction, and poetry. While reading this note I noticed that my favorite Dali poster which is hanging in my house, female figure with head of flowers, has exactly the same Alice figure jumping the rope as in the last illustration you have here. Exciting! I know just the Dali you’re talking about – it’s my favorite of his, as well! 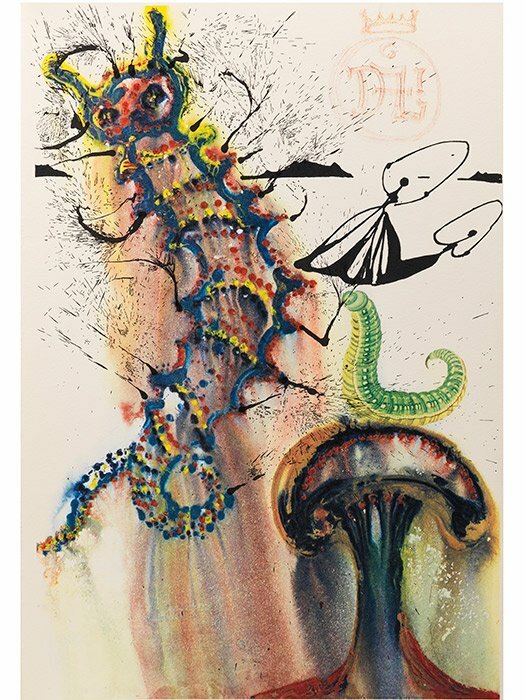 I never knew Dali drew his own edition of Alice in Wonderland. Two of my favourites in one! 1971 my lst year of college working in a bookstore in Minnesota the Alice Dali came in with a pair of white gloves. Loved it but could not afford the 100.00 price tag!